Consultants will try to find a route to make this path into more than a dead end. 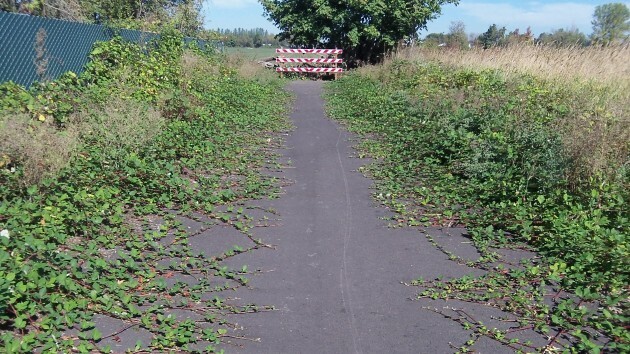 Benton County is taking the next step in planning for a bike trail between North Albany and Corvallis, and it begins with — what else? — hiring a consultant. County Commissioners Annabelle Jaramillo and Jay Dixon on Tuesday voted to hire Barney and Worth of Portland. Commissioner Anne Schuster voted no. The firm, which specializes in public involvement and strategic planning. will launch Phase 1 of an effort to find a location for the trail other than along the tracks used by the Portland & Western Railroad. That connection, though most direct, would slice through several farms, and the county planning commission nixed it a year ago. Under this phase, the consultant will evaluate other routes the path might take in the Highway 20 corridor, evaluate their feasibility from land-use and engineering perspectives, and involve the public in group discussions. Also planned are individual conversations with property owners who may be affected. The consultant may do some preliminary work during the summer, Public Works Director Josh Wheeler says, and the public process will start in the fall. The cost of this work has been estimated at just under $45,000. If Phase 1 comes up with workable alternatives for routing the path — along roughly 8.5 miles from the Albany to the Corvallis city limits — the county can order more detailed analysis in Phases 2 and 3. All together, the three-phase contract would total around $150,000, but the county can call a halt after the first or the second part. ODOT has pledged to contribute $50,000 toward the cost, the commissioners were told. Thanks for helping us keep up with the latest! I wonder if a simple rumble strip would help. May not be enough security for some. The next step in “The Corvallis Way” will to be to appoint a committee consisting of at least 25 people (representing every possible racial, economic, recreational, political, physical, or other possible interest) to study the issue and “gather input”. They will then hold numerous meetings and “public input” sessions. Then, in at least 2 years time, issue a report that states they can’t reach a consensus. They will also issue a press release that states how valuable this community input is, along with a commendation from the commissioners on how valuable it is and how much they appreciate their efforts. Note that they will not actually build any trail or move the process forward.